I put some values to form fields using following code . the problem is Thai character does not display in the PDF reader until I focus on that field . you are using a bad programming practice by adding non-Western characters in your code instead of using the UNICODE notation. you need to create a font that is able to write Thai characters (e.g. arialuni.ttf). Then read Chapter 8 of my book. More specifically the text that explains figure 8.3 and figure 8.4. In figure 8.3, the upper document shows the problem you are experiencing. In this case, we are adding a String with Western text as well as Chinese text as a field value. The Western text is shown, the Chinese text isn't. The second and third window, show what happens when you fill out the field correctly. 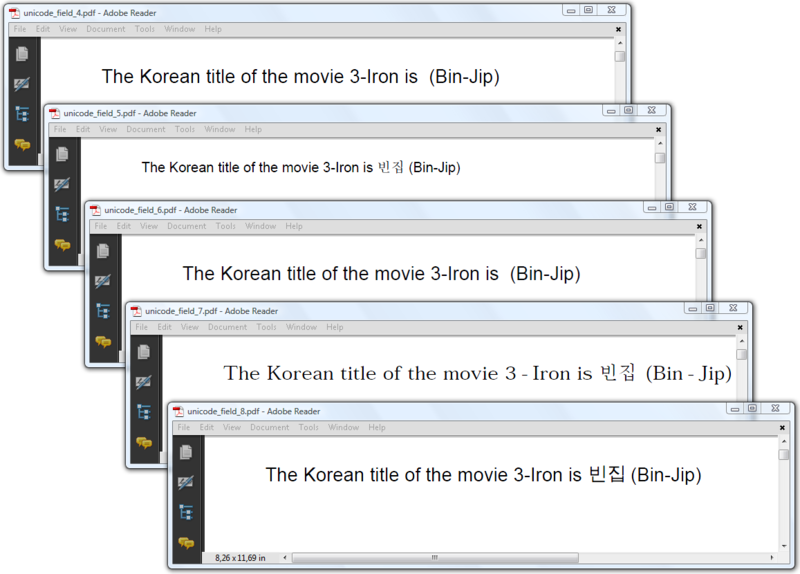 In figure 8.3, we try adding some Korean text. This fails in the first and third window, but we solved the problem in the second, third and fourth window. If you do not own a copy of my book, you may benefit from trying the TextFieldFont example that produces all the PDFs shown in the screen shots. There are, of course, other options, but this is one way to solve your problem. Not the answer you're looking for? Browse other questions tagged pdf itextpdf non-english or ask your own question. Why isn't HummusJS displaying pdf fill values in Acrobat Reader (but does in browser)?